Today is a lazy Thursday for me. 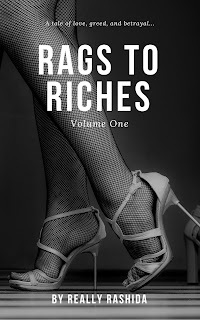 My plan is to chill, get some laundry done, and work on getting the word out about Rags To Riches Volume One. The book is available for free on iBooks, Nook, and Google Play. It's only $0.99 on Kindle because Amazon be hating. *shrugs* If you want it for free make sure to report to Amazon that it's free other places. There's a link at the bottom of the book's details that you can click to tell Amazon that the books is being sold elsewhere for a lower price. This is a rework of my series previously titled, No Sister Of Mine. I went through all of your reviews and took note. I hope you enjoy the new title and story!